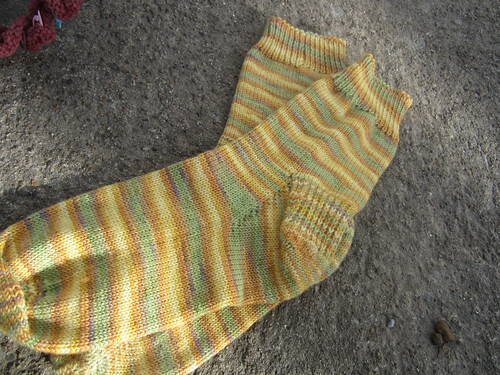 So I finished the socks yesterday. They are a little wide for my ankles, but they will be fine, especially under my boots. I used almost all the yarn which is one of my favorite things about making toe up socks. I don’t know what took me so long to try them. Wait. Yes I do. I didn’t want the cast off to be the top. I was concerned about them being less stretchy. It’s not usually a problem for me as I found out when I finally gave it a try. 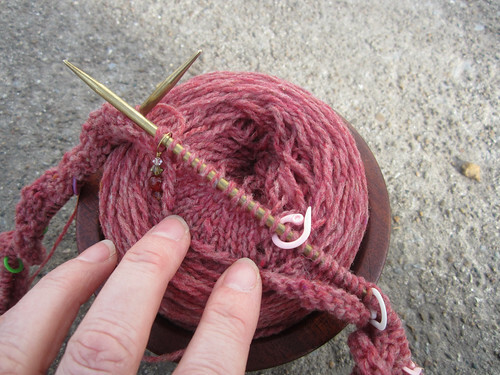 I have had to re-do a bind-off a time or two, but I use Jenny’s Surprisingly Stretchy bind off and that really does help. Okay, so what to work on next? Fix the Sprossling maybe? Nah! Work on one of my other hibernating projects? Nope! How about something brand new and sparkly? Perfect! Okay it’s not actually sparkly, but you know what I mean. Back in November of last year I saw Brooklyn Tweed’s new Loft when Jared introduced it on his blog. I decided had to sample it and I ordered a skein and looked through the Loft Collection for a fun single skein project to use it on. I decided on the Pei Loop Scarf. It looked quick, fun, and easy to wear. I cast on for it last night and worked the first 6 rows at which point I realized I had reversed the decreases so that they weren’t facing each other as they were supposed to. Argh! I considered leaving it, since it didn’t look terrible or anything, just different than the design was written. 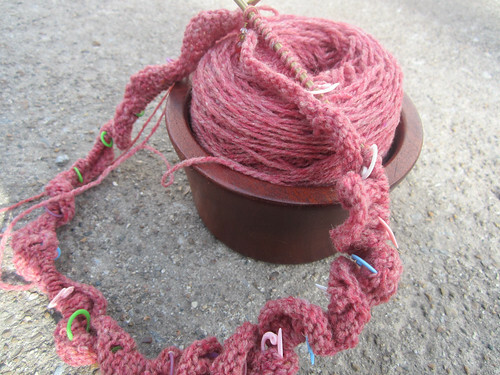 After a few curses, I knew it would bug me, so I ripped back 4 rounds and reknit. It wasn’t too bad; especially since this woolen spun yarn is lofty and sticky which means the stitches don’t easily slip around when they are loose from the needles. I love a nice woolen spun yarn and this one is yummy! They have a delicious color palette which makes me want to try a fair isle sweater out of it. Hmmm….